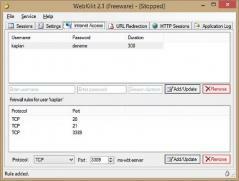 WebKilit is a HTTP interface for the Windows Firewall that allos you to control Intranet and Internet access as well as create custom URL redirection rules. You can use the app to set the HTTP port to be monitored and set up new URL redirection rules. Furthermore, WebKilit can use WinCap libraries to capture TZSP protocols and data. All HTTP sessions are logged and you can view comprehensive details regarding them, including server and MAC data in a dedicated tab. Nevertheless, WebKilit also enables you to define new firewall rules for individual ports, terminate connections, redirect URLs and much more!